Feb 11: Today’s Black History Month feature highlights two groundbreaking females, Tidye Pickett and Louise Stokes. 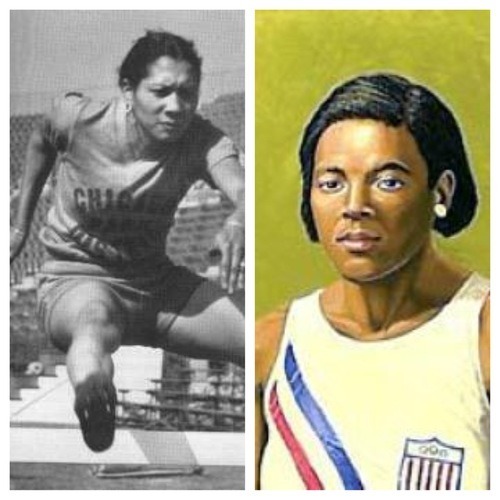 Pickett and Stokes were the first two African-American women to qualify to represent the United States in the Olympics. Born November 3, 1914, Pickett began running in Chicago and was a star at Englewood High when she was selected as an alternate in 80m hurdles, 100m sprint and the broad jump in the 1932 Olympics in Los Angeles. Louise Stokes was born in 1913 in Maiden, MA and began running in junior high school. As a senior at Maiden High School, Stokes qualified for the Olympic team after setting the New England record in the 100 meters, and tying the world record in the standing broad jump in her junior year. Both Pickett’s and Stokes’ performances qualified them to compete in the 1932 Olympics; however, because of racial bigotry only white athletes were allowed to participate. Not only were the women not allowed to compete, but they were forced to eat and live in quarters separate from their white counterparts. Despite such public discrimination, the women persevered and continued to compete in their respective events. Pickett again qualified for the Olympics in 1936 with her performance in the 80m hurdles. This time she was allowed to compete and made it to the quarterfinals of the event where her journey ended after breaking her foot on a hurdle. Stokes again qualified to run in the 4x100m relay; however, just as in 1932, she was replaced by a white runner in the finals of the event. These two women were pioneers for African American athletes in track and field. Because of their talent and their will to compete and endure racial bigotry, African American athletes can freely compete and represent their country in the Olympics and beyond.